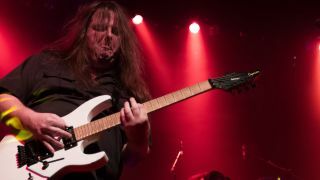 Back in May, Symphony X guitarist Michael Romeo announced his official solo debut, War of the Worlds, Pt. 1. Today, Romeo premiered the lyric video for the album's latest single, "Fear the Unknown." Recorded mostly at Romeo's home studio, War of the Worlds, Pt. 1 features Rick Castellano on vocals, plus Black Label Society's John “JD” DeServio on bass and John Macaluso on drums. It is set for a July 27 release via Music Theories Recordings/Mascot Label Group. "Another one of my favorite tracks," Romeo said of "Fear the Unknown" in a press release. "This is the second song on the album after the 'Introduction', and I wanted something uptempo, melodic, with some 'riffage' happening. ‘Fear the Unknown,' along with 'Black,' were two of the first songs I wrote for this album." You can check the song out below. Inspired by the H.G. Wells novel of the same name, and film score giants Bernard Hermann and John Williams, War of the Worlds, Pt. 1 features everything from classic metal textures to, according to a press release, touches of EDM and dubstep. On top of all that, Romeo is also preparing a second War of the Worlds album. You can preorder War of the Worlds, Pt. 1 right here, and check out its tracklist below. For more on Michael Romeo, head on over to michaelromeomusic.com.